Our experience of the city is often by going over things. We take bridges over rivers. We travel on roads that go over other roads. We ride on subway cars that coast over ravines. This is great if you want to get around quickly, but so much of our city happens in the spaces underneath these things that we end up missing out. Toronto’s ravines are the obvious casualty of “going over things” because ravines are often the things that we are going over. 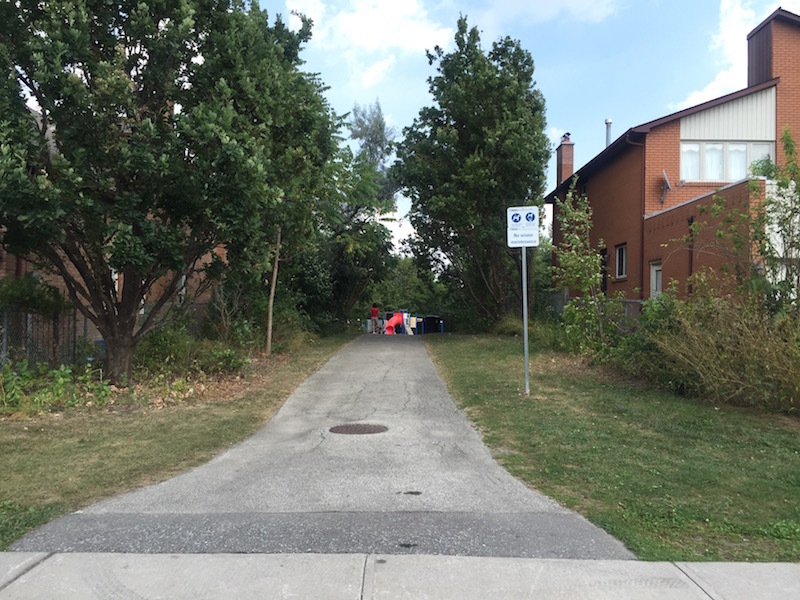 While these natural areas thread their way through so much of our city, tying different neighbourhoods together and linking parks and schools and tower communities, we often don’t realize they’re there because the city is designed to cross over top of them. By dipping down into valleys, ravines, and underpasses you get a whole new perspective. It feels kind of like travelling the back alleys of the city. Down here the city is quieter, darker, and damper. Infrastructure soars overhead and paints a post-apocalyptic picture. It’s easy to imagine the world has ended and you’re all that’s left, walking through a ruined landscape that nature has begun to retake. 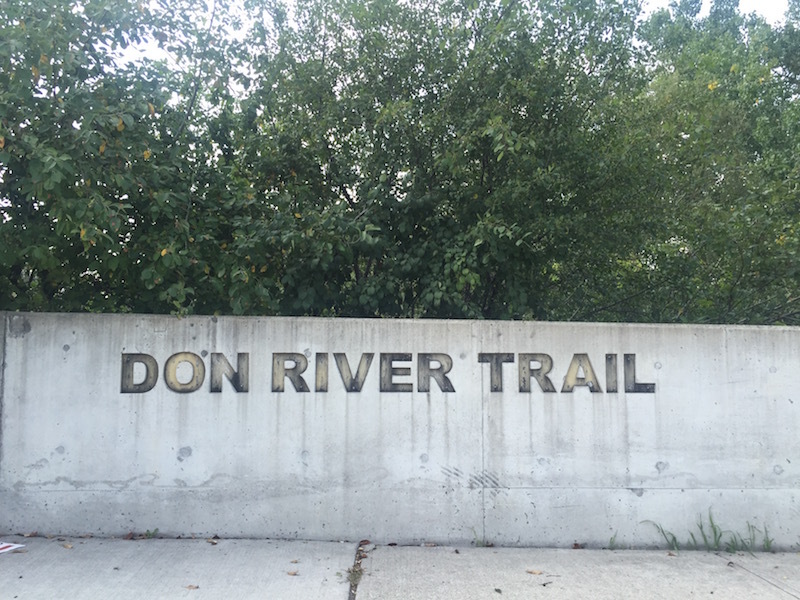 For this walk, with my friend Eleni in tow, I chose the Don River Trail which leads into the Betty Sutherland Trail, tying three wards together across two very busy roadways and the busiest roadway of them all–the 401 highway. As ravine walks often do, this one started by finding a narrow pathway sandwiched between two large houses in a subdivision. Follow the trail a little bit and go down some stairs and you’re transported out of this suburban-style neighbourhood with its cut-and-paste house styles and looping roads, and into a lush, quiet green oasis. The first thing we went under was a narrow rail trestle that spanned the ravine. 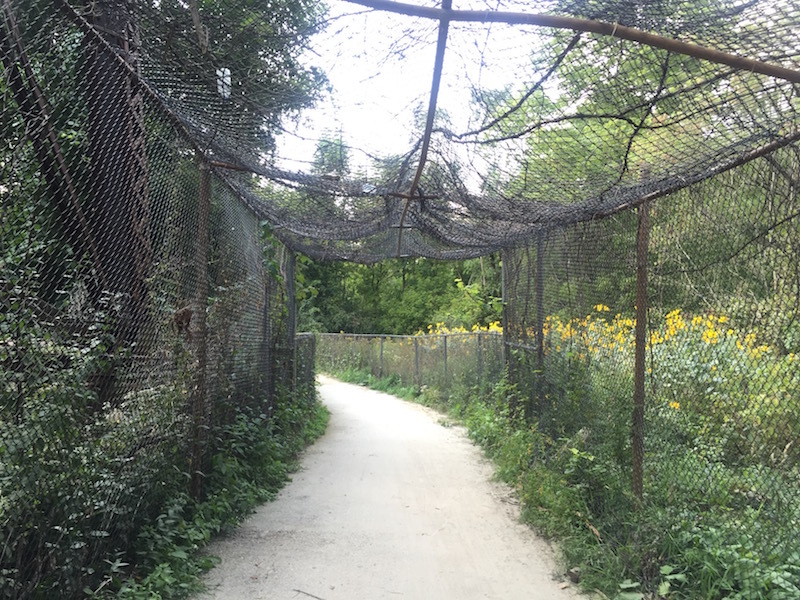 A battered chain-link cage was constructed over the pathway to save us from any falling debris. It was all very Lost-esque. The path wound around before spitting us out at the busy corner of Sheppard and Leslie where we had to cross two large, roads–each highways in their own right–to get to the Betty Sutherland Trail connection on the other side. 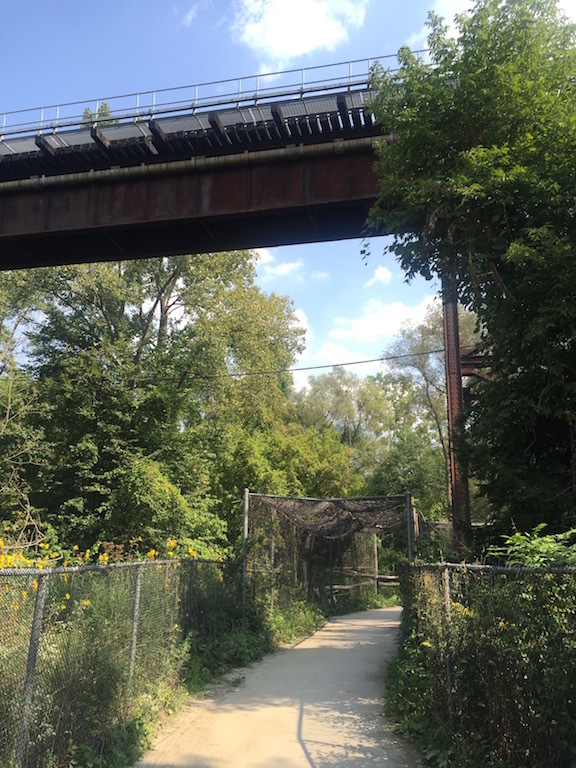 This trail swoops south, bending around the North York General Hospital and following the lazy East Don River underneath the 401 highway. 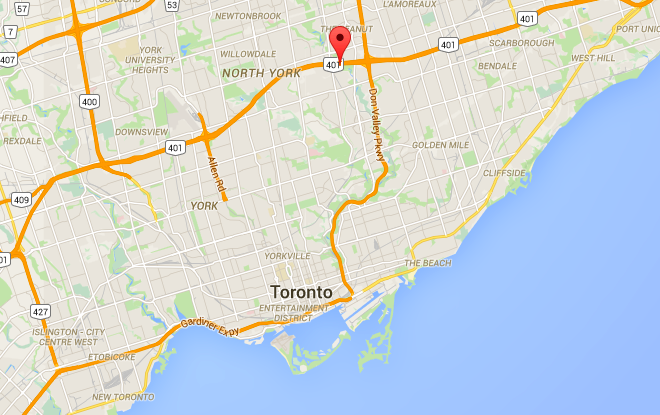 I never really thought about the 401 as having an underside, but yet here we were. 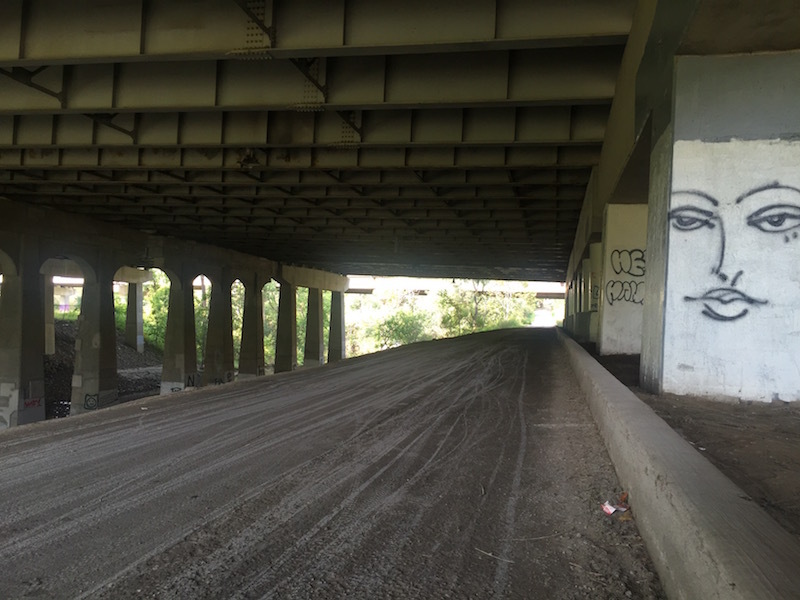 Sitting under a highway is a strange thing. Each car sounds like a bomb going off very, very far away, but it’s quieter than you might think. In a weird way it reminded me of sitting in a big church with a soaring ceiling and many columns. Terrible graffiti–the kind that teenagers write (“Fred is a loser”)–was scrawled over the supporting pillars. If the world was coming to an end, this would be a good place to make camp. Roast some rats over oil drum fires and talk about the good ol’ days when we had electricity, that sort of Cormac McCarthy-style thing. We finally left the shadow of the highway and stepped out into bright green nature on the other side. The trail kept unfurling, a pathway lined with yellow flowers and high grass. The highway hummed behind us, hidden up above.